Despite missing on earnings, the market reacted favorably to Tesla’s Q2 earnings report thanks to a beat on revenue and apparent reduction in cash burn. Tesla claims it can service its debts with internally generated cash flow, but without a very considerable increase in cash by year-end, the company could be in breach of covenants. Moody’s has downgraded Tesla once this year and stated Tesla will have to raise considerable sums to continue operations. With Q2 finished, Tesla’s cash position has worsened and it has failed to meet production targets; a further downgrade thus seems imminent. When Tesla (TSLA) announced its Q2 earnings last week, the market was overjoyed. The stock soared more than 15% despite missing on earnings. The ebullience was largely the product of improved revenues, lower than expected cash burn, and the renewed pledge that Tesla can become profitable in Q3 – and won’t be needing any further capital infusions. Despite all the hoopla, things are not so great at Tesla when we look under the surface. , the company’s cash position and net debt has gotten progressively worse. The picture is further darkened by the rise in accounts payable: Payables rose from $2.603 billion in Q1 to $3.03 billion by the end of Q2. 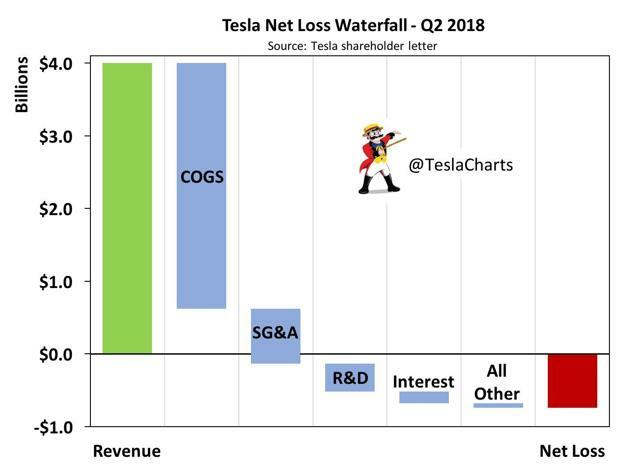 In a recent research note, we addressed the question of whether Tesla could in fact deliver on the promise of profitability in Q3. In that note, we found that, even making wildly optimistic assumptions (such as Tesla being able to deliver every single vehicle produced during Q3 in Q3), it would still take the sale of hoarded ZEV credits to tilt the company into the black with a net profit of about $160 million. Such a move is fundamentally unsustainable. We will be writing a further note in the coming week or two in which we will model out successive quarters, but that is beyond the scope of this article. Today, instead, we focus on one particular elephant in the room: the imminent downgrade of Tesla’s credit. For all of Tesla CEO Elon Musk’s posturing about not needing to raise capital, virtually every external analyst thinks otherwise. 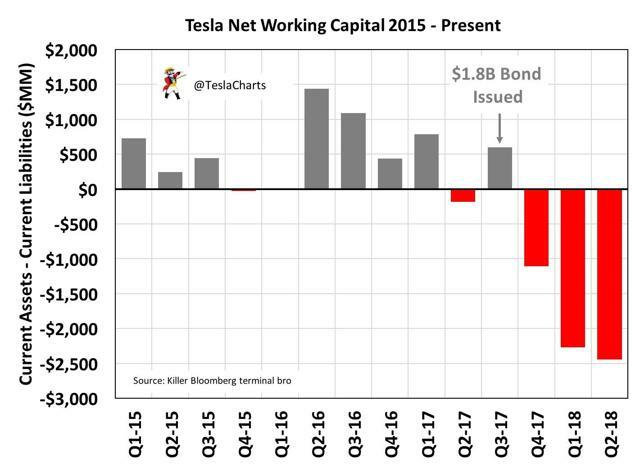 Even those that believe Tesla can tip into profitability in Q3 and beyond recognize that, even if Tesla can start producing significant operating cash flow, such cash will be insufficient to service a pile of debt coming due in the relative near-term, let alone the entirety of its approximately $10 billion debt mountain. The terms of certain of our credit facilities, including our senior secured asset based revolving credit agreement, contain, and any of our other future debt agreements may contain, covenant restrictions that limit our ability to operate our business, including restrictions on our ability to, among other things, incur additional debt or issue guarantees, create liens, repurchase stock or make other restricted payments, and make certain voluntary prepayments of specified debt. In addition, under certain circumstances we are required to comply with a fixed charge coverage ratio. As a result of these covenants, our ability to respond to changes in business and economic conditions and engage in beneficial transactions, including to obtain additional financing as needed, may be restricted. Furthermore, our failure to comply with our debt covenants could result in a default under our debt agreements, which could permit the holders to accelerate our obligation to repay the debt. If any of our debt is accelerated, we may not have sufficient funds available to repay it. The full scale of this threat may be slightly overstated, however. For example, the $82.5 million promissory note due in August is largely due to Elon Musk himself. As such, it is likely he will work out a way to roll that debt over into the future and thus prevent the outflow at this critical juncture. But that would still mean Tesla requires cash in excess of $1.79 billion just to cover its debt requirements through March. Now, a Tesla bull might come out and argue that the lion’s share of this debt, the $920 million due in March 2019 may not be necessary thanks to its being convertible with a conversion price of $359.87 per share. As of writing, Tesla was trading near $350 a share, so it is not beyond belief that it will be able to climb high enough to force conversion rather than cash payment. However, the nature of debt covenants requires the debtor to act as if the conversion is not guaranteed. While it might not have to use the $920 million in March, it will have to have it available. Deepak Ahuja – Tesla, Inc.
Yeah, we’re executing on an operating plan that keeps us sufficiently self-funded despite our CapEx needs and our debts maturing, and still keep a very healthy balance on our balance sheet. Elon Reeve Musk – Tesla, Inc.
Yeah, our default plan is we pay – we start paying off our debts. I don’t mean refi-ing them, I mean paying them off. For example, there’s a convert that’s coming due soon, a couple hundred million, $900 million, something like that. We expect to pay that off with internally generated cash flow. And still be – still have a healthy cash balance. Whether the “I don’t mean refi-ing them, I mean paying them off” applies to the promissory note is unclear. But it is clearly referencing the other near-term debts, including the March convertible. Benjamin Joseph Kallo – Robert W. Baird & Co., Inc.
And mine too. Deepak, so after July here, how close are you to cash flow positive? So your question is after July, how close are we to cash flow positive? Yeah, you have July under the books here, so how close are you to cash flow positive? Yeah, well, we don’t have let me tell this point, one, we don’t have July results done but it doesn’t matter exactly where we are in the month of July. What really matters is over the quarter because it depends on deliveries, depends on production, many factors. So we will be significantly cash flow positive for the quarter. I think that’s what really matters. And like the logic question is like do we have like a low balance in the bank? The answer is no, we’ve got – we’re in no – we’re not in any kind of cash shortage at all. Yeah, that’s a simple answer. It was a bit of a bizarre exchange. Baird analyst Ben Kallo was asking if Tesla was cash flow positive in July then Elon answered that Tesla was not insolvent. Deepak did little to help the situation, essentially admitting that July was not profitable and that what matters is the full quarter. 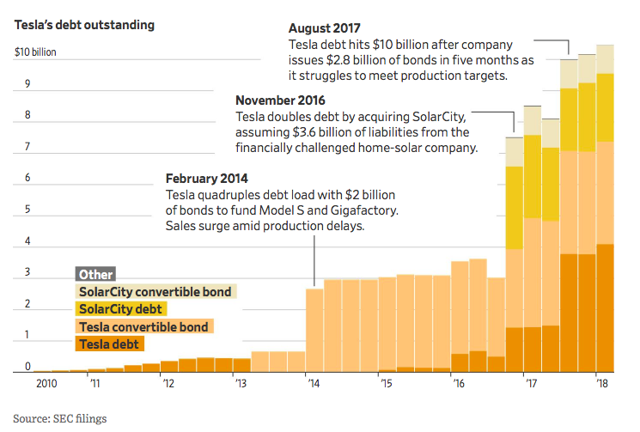 In any event, how Tesla intends to pay off all these debts remains a mystery to virtually all analysts – and credit rating agencies. Corporate family rating lowered to B3 from B2. Senior notes lowered to Caa1 from B3. Speculative grade liquidity rating lowered to SGL-4 from SGL-3. Tesla’s ratings reflect the significant shortfall in the production rate of the company’s Model 3 electric vehicle. Tesla’s rating could be lowered further if there are shortfalls from its updated Model 3 production targets. These cash needs will likely require Tesla to undertake a near-term capital raise exceeding $2 billion. Now, with Q2 in the rearview mirror, things look even worse for Tesla based on the two criteria set by Moody’s. In terms of production, the average production target of 5,000 Model 3 sedans per week remains out of reach. Indeed, company guidance for Q3, as stated in its Q2 shareholder letter, has set a target for producing between 50,000 and 55,000 Model 3s during the quarter. That is well below 5,000 per week. We have seen some bull commentary suggesting that “what Moody’s meant” was that it wanted Tesla to hit its 5,000 per week rate period, not necessarily on a sustained basis. Anyone who knows anything about ratings agencies will probably laugh at such a notion. That is because ratings agencies are wholly unconcerned with one-off gimmicks and burst production rates. The whole point of credit-worthiness is stability. While Elon’s games can impress the market, they are unlikely to impress Moody’s. The cash issues are also persistent. Even after ratcheting down the outright burn a bit, the total cash outflows remain high, and Tesla’s cash position is considerably weaker now than it was when Moody’s last issued a downgrade. With cash running out and profitability in Q3 highly dubious, it seems extremely likely that Moody’s will issue a further downgrade in the near-term, probably before the end of Q3. A Moody’s downgrade is no small thing. Tesla’s bonds have already been trading at a steep discount and, despite some improvement post-Q2 earnings, the credit default swap market still suggests a high risk of default or liquidity crisis. While Tesla stock and bonds have rarely traded in tandem, a Moody’s downgrade invariably batters them both. In March, after the downgrade announcement, shares fell nearly 8%and bonds hit all-time lows. Given that Tesla’s shares have been enjoying an extremely strong post-earnings rally, a fresh downgrade could cause a substantial pullback. We expect that Moody’s will not be standing idle as Tesla barrels toward a debt cliff. Tesla shareholders should be on their guard for a downgrade and be prepared to act accordingly.